ADSB is an increasingly useful addition to the data collection, but will not be capable of providing a full set of the raw data needed for the reports, until every aircraft at every airport has ADSB. Transcription of at least some voice radio calls for other aircraft will be needed well into the future. 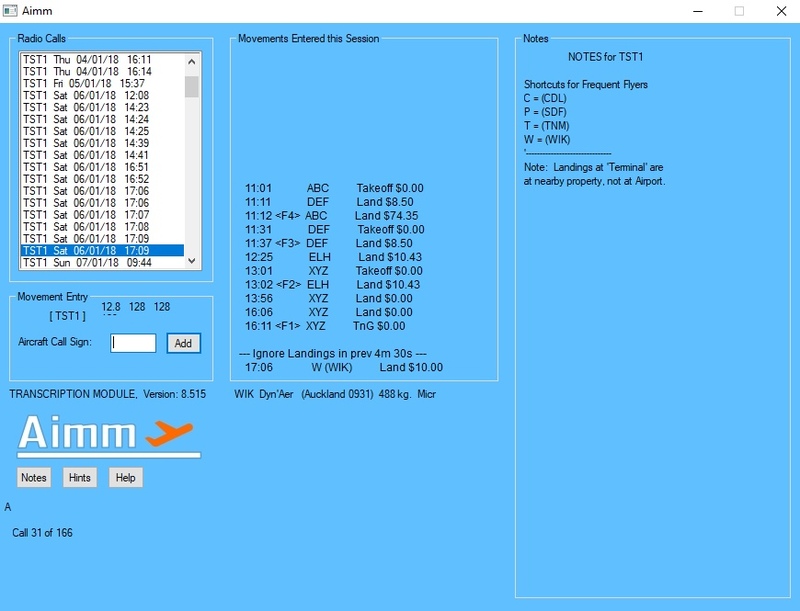 -- Many Airports have Aimm's staff handle the radio call transcription, in which case they do not need to do anything except read the monthly reports which are sent out automatically within a week of the end of each month. -- Other Airports prefer to playback the radio calls and transcribe the movements themselves, with their staff or contractors using the special Aimm Transcription Module. This can be done from any Internet connected Windows computer at the Airport... or from Home with full timesheet control. In event of an incident, noise complaint or refused landing fee, the Airport might sometimes want to listen to radio calls for the relevant period. By visiting this Aimm website (www.aimm.aero), anyone authorised by the Airport can log-in and go to the Airport's own Aimm home page. They can 'fetch' radio calls for any period, from several years ago up to the last few minutes at the Airport... it is not necessary to wait for the radio calls to be transcribed. The 'fetch' can be done from any Internet connected device that can play a 'wav' file (most can), and allows an incident or complaint to be resolved without the need for a special visit to the Airport after hours or at weekends. Some Aimm Clients visit their Aimm webpage frequently to see how the month is progressing, others hardly ever visit as they are happy to rely on the monthly reports that are sent out automatically. The data is there if they need it. 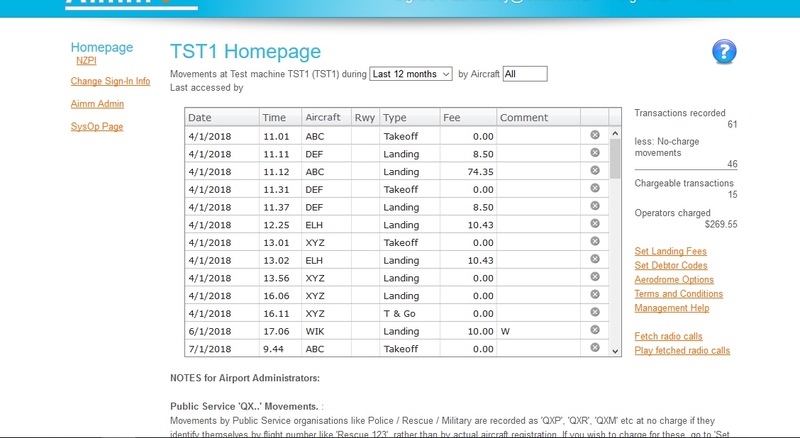 Each client Airport has its own page on this Amm website to give its staff full access to its data, with the ability to edit / add / delete any movement as required.. The radio call transcription takes care of entering all the movements, and the automatic reports deliver the information within a week of the end of each month. If ever needed, any authorised Airport staff member can visit this website, log-in and add / delete / change the fee for any movement regardless of whether Aimm staff or their own Staff are doing the radio call transcription. They can also see what level the running total of movements and fees for the month-to-date has reached, or look back to previous months. A search can be done for an individual aircraft, (or all aircraft), for a range of periods, usually when a query arises as to the usage patterns of a particular aircraft. 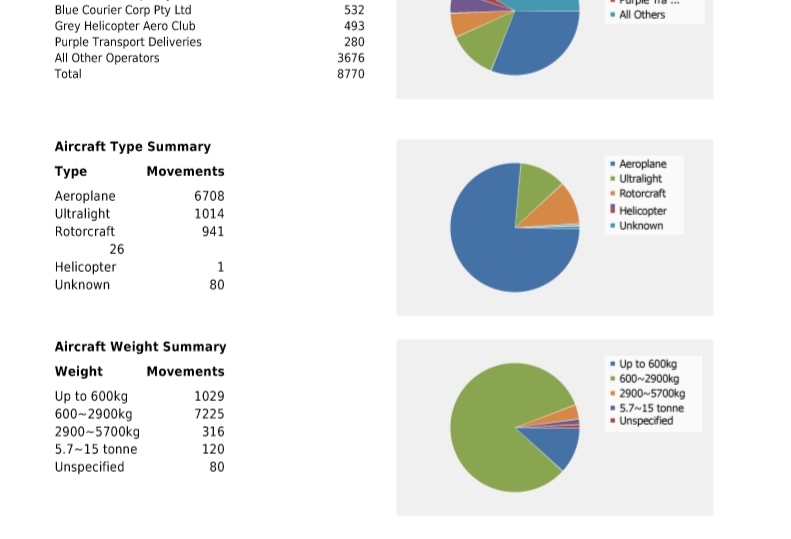 Part of the monthly 'Dashboard' Management report, which picks out the KPIs and summarises the data to allow for informed decisions. Many of the situations that occur at Airports repeat themselves... Noise complaints, Compliance questions, Funding and Revenue reviews happen at most Airports occasionally. Aimm senior staff are experienced Airport Operators themselves, and have the benefit of seeing the results of actions that have been taken at many Airports. They have summarised these in the discussion papers below. Aimm staff are also available on the phone for discussion, which can take the form of a five minute chat at no charge, or a full paid consultancy with written report. Often just having someone to 'bounce ideas off' is all it needs for the best course of action to become clear.